Today’s semiconductor chip processing involves hundreds of discrete steps and extremely expensive machines and equipment.Precision is of paramount importance. Any non-precise movement caused by the failure of a component—for example, a waferslipping from robotic grip—can result in significant financial loss, and even worse, unplanned downtime for maintenance. Therefore, many hi-tech companies have embarked on implementing Industry 4.0 manufacturing by deploying sensors aroundtheir costly machines and equipment to collect, transmit, aggregate and analyze operating data under an Internet of Things (IoT)architecture. They enable alert and alarm functions and implement preventive maintenance through analysis of both real time andhistorical data. 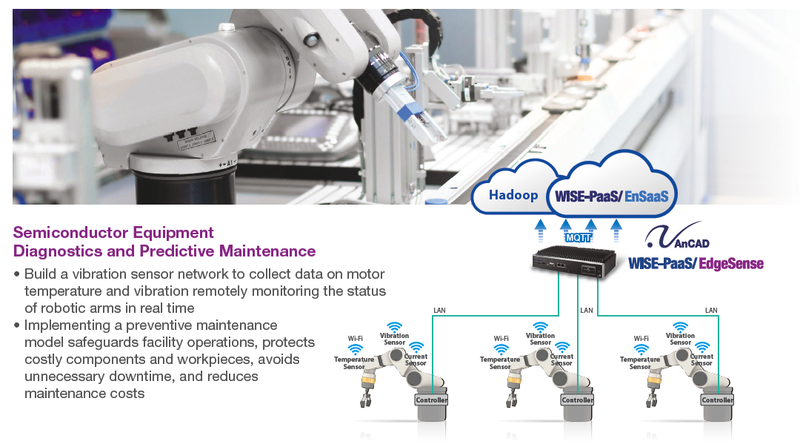 The preventive maintenance is a cloud service that analyzes aggregated sensor data to discover patterns so as to alert the propertyowner to repair or replace problematic machine components in advance of actual failures. By developing and implementing apreventive maintenance model, the hi-tech companies safeguard operations of their facilities, protect their costly components andsemi-finished products, avoid unnecessary downtime and reduce maintenance costs; their ultimate goals are to improve boththroughput and quality. Our customer in this case was one of famous chip manufacturers, who wished to establish an IoT-enabled intelligent monitoringsystem overseeing all machines and equipment in their facilities, with the intention of implementing preventive maintenance once theaggregation of data was sufficient for big data analysis. They started by adding sensors to the robotic arms used to move wafers to lithography equipment in the yellow-lighted clean rooms.The robotic arms were prioritized because the mechanics of the robotic arms were beyond the range of the lithography equipment’sbuilt-in monitoring capabilities, and had been most susceptible to inaccuracy and failure; so this was the first priority for remediation.Sensors were deployed to collect motor vibration and temperature data . Leveraging the Equipment Vibration Monitoring Solution provided by Advantech and AnCAD vibration monitoring software co-creation partner, our customer successfully built a vibration sensor network to collect data on motor temperature and vibration remotely monitoring the statusof robotic arms in real time. Implementing a preventive maintenancemodel safeguards facility operations, protectscostly components and workpieces, avoidsunnecessary downtime, and reducesmaintenance costs.